Properties in Urola-Kostaldea average 4.6 out of 5 stars. Relax a few days by the sea and Restaurant Argiñano. 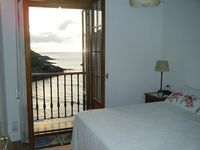 Property 29: Relax a few days by the sea and Restaurant Argiñano. We loved Pili's apartment. It was immaculate, had gorgeous views of both the ocean and the town. We bought groceries in the local shop, enjoyed dining in the restaurants, took a hikes up the hill and around the wharf. The bus from San Sebastian was clean and pleasant. We were sorry to leave. I would have liked to have stayed at least another week! Pili responded to our requests promptly and otherwise left us alone to enjoy ourselves. The apartment is very homey, everything worked, etc.